In extreme Metal genres, you have those that will never get anywhere due the lack of personality. But of course you’ll find those that are here to lead, those that are ready for great trials, prepared to war, to plunder and conquest new fans, being in a constant process of evolution with their music. The Austrian band BELPHEGOR is a famous (and infamous) name on Death/Black Metal scene. If “Conjuring the Dead” was not received well for the fans, I must say that “Totenritual” will not rebuild their fans trust, but will gather more and more legions. This time, the band’s music is not so extreme on low tunes as on “Conjuring the Dead”, but back on their earlier Death/Black Metal way, with the same aesthetics, but with a wonderfully creative insight. 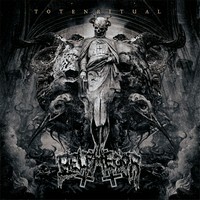 In terms of composing, “Totenritual” can be named as one of the band’s greatest moments. The music flows in an aggressive and brutal way, but with such spontaneity that really amazes the listener. It’s violent, but with a very good taste. The sound quality of “Totenritual” is excellent. With Jason Suecof on the mix, and Mark Lewis on the mastering, creating a perfect blend between the natural and oppressive brutality of the band’s musical work with the level of sound clarity that their songs need to be understood. And this time, due the tunes of the musical instruments aren’t as low as heard on “Conjuring the Dead”, their songs flows defined and easily. And the artwork created by Seth Siro Anton is amazing, morbid and darkened, with the right feeling for the album. But as the album’s sound quality is better, the work of BELPHEGOR improved a lot. The guitar riffs are violent and personal in a form that the brutal harmonies of the band can be understood easily (and the solos are still as sick and morbid as always); the work from bass guitar and drums is solid and technical, creating a heavy and brutal rhythmic, and the vocals are excellent with this changes between guttural grunts and harsh screams. Although all the songs are excellent, the tempo changes and oppression created by bass guitar and drums on “Baphomet” (a morbid song filled with a darkened touch), the bitter and fast “The Devil’s Son” (what great work from guitars, strangling our eardrums easily with excellent riffs), the bone crushing technical work shown on “Swinefever - Regent of Pigs”, the mix between fast parts and slow bitter moments of “Totenkult - Exegesis of Deterioration” (where the vocals are excellent), the excellent conductions of rhythms of the drums and the melodies on guitars of “Spell of Reflection”, the Death Metal Greagorian chants in some parts of “Embracing a Star”, and the mass killing speed of “Totenritual” can be said as the finest moments of the album. A great masterpiece of brutality!